• Stay prepared by bringing out your emergency preparedness kit and having a supply of essential items (food, water, warming items, radios, batteries, flashlights, etc.) available. • Stay informed by monitoring TV news, news radio, National Weather Service radios and the Internet. Important information may be broadcast that could affect you and your family. Ensure your cell phones and lap top computers are fully charged now – before the storm occurs. • Stay safe by keeping fire safety and injury prevention a priority in your activities. It is important to remember that fire apparatus and ambulances will be slower to respond to your emergencies due to the weather and hazardous driving conditions. Check your smoke and carbon monoxide alarms now to ensure they are working. In the event of an emergency, have an escape plan and call 911 immediately from a safe location. • If possible, stay indoors and off the roads at all costs. Reduced traffic on roadways will allow public works crews an opportunity to clear a path that can be used by first responders to handle emergencies. If you must venture outdoors, dress warm and in layers, wear a hat and gloves, and cover your face with a scarf. • A winter storm always has the potential to cause power disruptions as snow and ice will collect on power lines and tree branch’s that will then come in contact with power lines. Do not approach a downed power line – always consider downed power lines to be “live.” Restrict access to the downed lines and call 911. Never operate a generator indoors or near exterior doors and windows as lethal carbon monoxide could make its way indoors. • Speaking of calling 911 – please – only call 911 for emergencies. Activity for Fire and EMS service could be high. If you do not have an emergency you should call 311 for assistance. • In the event of power outages – use flashlights and battery powered lanterns for illumination – do not use candles. Ensure you have a battery-powered radio. Never operate a generator indoors, including garages, or near exterior doors and windows. • Give space heaters space – keep space heaters at least 3-feet away from anything combustible like bedding, furniture, paper, etc. • Use only seasoned wood products in your fireplace and use extreme caution when disposing of fireplace ashes, as they can remain hot for days after the fire is out. Dispose of ashes in a metal container outside and away from the house. • Some winter storms produce enough snow and ice that will make it difficult to shovel, especially for those that have an existing heart condition or anyone over the age of 50. Limit shoveling to only a few minutes at a time, shovel smaller amounts, and take frequent breaks. • It is time to be a good neighbor – check on your senior citizen neighbors and ensure they have heat and food. Shovel their sidewalks and check on them frequently. • Clear away snow from the fire hydrant on your street. If the fire hydrant is on your property; you are required to clear away the snow. • If you must drive – reduce your speed, increase the distance between you and the car in front of you, turn on your headlights, and do not be distracted by cell phones. Keep an eye out for pedestrians, as they will venture out into the streets as sidewalks disappear. This information especially applies to 4-wheel drive SUV operators. Road condition could be dangerous to travel to your appointments over the weekend. Dialysis patients please contact your centers and discuss your access to the center. You might arrange for a delay in your treatment until Monday. Consult your center as soon as possible. Finally, remember to think of our four-legged furry friends and keep your pets indoors. 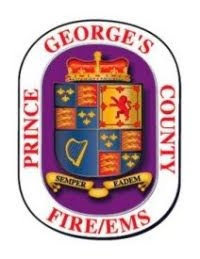 The Prince George’s County Fire/EMS Department stands ready and prepared to provide the best emergency and non-emergency services available. We ask you to help us by preventing emergencies from ever occurring to avoid the need for us to have to respond to that emergency. Remember, Safety First ensures Everyone Goes Home.